If you’re a mama-to-be, watching your baby bump pop can be one of the most fun parts about being pregnant…until you realize you can no longer button your pants. Work your wardrobe. First things first: take a good look through your closet and do a once-over of everything you think might work as you start rocking your bump. 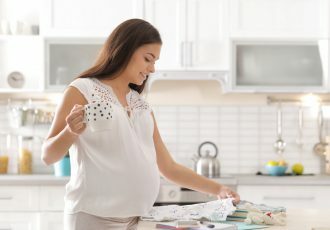 From shift dresses to blouses, you’ll be surprised what non-maternity clothing you’ll still be able to wear once you start to show, especially before 20 weeks or so. You’ll also want to pick up a maternity band; it’s a lifesaver for those early weeks when you can’t quite button your regular pants but aren’t yet big enough for maternity styles. Basics are best. When you do need to make the move into full-on maternity wear, usually sometime in the second trimester for most women, stick with the essentials. Leggings are your friend. So are a good pair of maternity jeans. Both can be dressed up or down and can be worn from the first time you feel that tummy pop all the way through week 40. Depending on the season, it also makes sense to invest in a few basic tees, a cozy sweater, a versatile dress, a tailored pair of black pants, and a top you can dress up or down. And never underestimate a good pair of maternity joggers for those days when you just can’t deal with wearing actual pants. Consider a subscription or rental. A maternity subscription or rental service is a great option when you’re thinking about what types of maternity clothes you’ll want. These typically send you a shipment of new, curated pregnancy wear to buy and keep every month or quarter, with pieces catering to the season, your style, and what trimester you’re in. Rental services allow you to wear the pieces for a certain amount of time, then send them back. You do you. And lastly, you rock that bump however you’d like. Forty weeks of pregnancy is no easy feat. Wear what makes you feel good; wear what makes you feel comfortable; wear what makes you feel confident. You deserve it! Babylist is the premier platform for expecting and new parents. It also produces helpful content and videos about pregnancy, baby gear and parenting.